The prisoner was Giovanni Herrin, charged last month in connection with the shooting death of his teenage girlfriend in Kent. About what transpired Wednesday when the prisoner escaped, the director of youth and adult detention for King County, said, "From what I've seen, the officers did what they were trained to do." A guard from the King County Jail shot and wounded a prisoner – a murder suspect –in Seattle on Wednesday morning, after the prisoner escaped from Harborview Medical Center. Police identified the prisoner as 19-year-old Giovanni Herrin, who was charged last month in connection with the shooting death of his 18-year-old girlfriend, whose body was discovered on a trail in Kent. 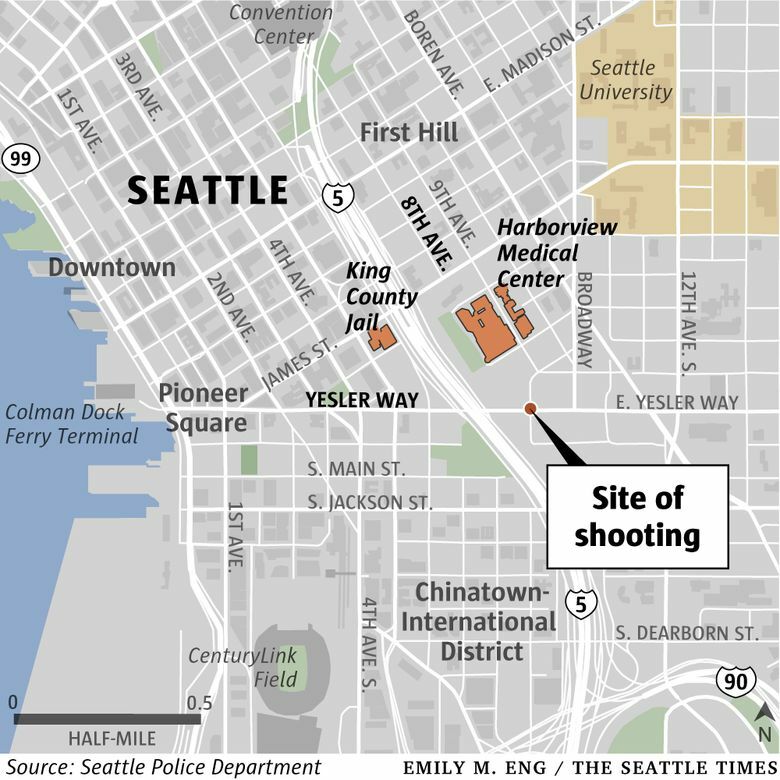 The injuries Herrin sustained in the shooting at Eighth Avenue and Yesler Way, just beyond the hospital’s campus, are not considered life-threatening. He is being treated at Harborview. The jail guard was not hurt. Herrin had been taken by van from the jail a few blocks away in downtown Seattle to Harborview earlier Wednesday, after he complained of not feeling well, said Seattle Assistant Police Chief Marc Garth Green. No details were immediately released on how Herrin escaped from the hospital. He ran two or three blocks, Garth Green said, and approached a car driving past with a couple inside. It’s not clear if Herrin tried to take the car, but there’s no indication that the drivers were involved in any escape plot, Garth Green said. The guard shot the prisoner shortly after he approached the car, at about 10:15 a.m.
Garth Green said police do not believe Herrin was armed, but are not positive. There are circumstances under which legal precedent justifies firing on a fleeing unarmed suspect, depending on possible risk to the public, Garth Green added. Hayes said two officers were guarding the prisoner in the hospital. Police are interviewing staff at Harborview and looking for any video footage of the escape, Garth Green said. The jail is also conducting an internal investigation. The officer who fired the shots has been placed on temporary administrative leave, Hayes said. Herrin was charged with first-degree-murder domestic violence and first-degree unlawful possession of a firearm. Police say he lured Barreto-Sabalza into the woods at a Kent park on June 16 and shot her once in the head at close range.